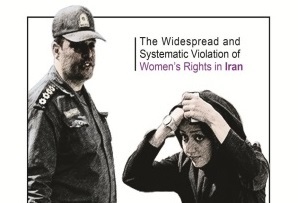 March 7, 2014 | To mark International Women’s Day Justice for Iran (JFI) has published a major report on history and politics of enforced hijab under the Islamic Republic of Iran. Thirty-five Years of Forced Hijab: The Widespread and Systematic Violation of Women’s Rights in Iran points out over the past ten years more than 30,000 women have faced arrest throughout Iran due to hijab laws. Iran is the first country where the state forces all girls and women to observe uniform hijab laws. Without a clear definition of hijab, Islamic Republic laws consider women who lack “Islamic veil” in “public” as criminal and punishable by imprisonment and fines. The call for enforced hijab was first raised 35 years ago by Ayatollah Khomeini, the founder of the Islamic Republic, just 24 days after the revolution was declared victorious, on 7 March 1979. However, given the resistance of a considerable percentage of Iranian women, it took three years of tension and violence to enforce this law. Although Islamic Sharia laws deem hijab compulsory at age 9, Islamic Republic requires all girls to begin observing hijab laws at the outset of primary education at age 7. It also imposes hijab laws on women of all faiths regardless of their sacred teachings on the issue of hijab. Furthermore, it is used as a tool for segregation and imposition of a wide range of limitations on women including violations of fundamental rights, including the right to education, work and movement. The report documents over past 35 years many women have been deprived of education, employment, driving, travelling by air, access to public medical services as well as cultural and recreational facilities because of their hijab. It also refers to instances involving arrest and other violations of the articles of the Convention on the Rights of the Child through impositions of hijab rules on girl children. In addition, the report embodies a comparative look at the Islamic Republic’s efforts to enforce hijab laws in contradiction to its international commitments. As a signatory to the International Bill of Rights and the Convention on the Rights of the Child Iran is duty bound to implement the articles. However, many of its domestic codes and procedures on hijab violate the rights enshrined in these documents. The report goes on to point out how a high number of women are not only exposed to insult, harassment and physical abuse at the hands of the authorities, but that they also face detention and various forms of torture, including lashing. The report describes the process of arrest and prosecution of women based on the charge of improper Islamic hijab and unjust sentences. It also presents an overview of the psychological abuse where in some cases women have faced death or suicide. However, it also highlights an important historical fact that despite 35 years of violent enforcement measures, Iranian women continue to resist hijab laws and through their daily struggles provide an example for women in other Muslim majority countries, in particular those in transition, to demand their rights and freedom. In addition, based on official statistics, reports by human rights organizations and victim statements instances involving harassment, such as expulsion of women from governmental offices, refusal to grant promotion on the grounds of lacking proper Islamic hijab, banning access to education, summoning female students to disciplinary bodies and expulsion from dormitories continue unabated. Furthermore, despite many promises there has been no tangible improvement since Mr. Rowhani took office. “Thirty-five Years of Hijab” offers a number of recommendations and highlights the need for the international community to shine a spotlight on forced hijab as a symbol and means of advancing serious and systematic human rights violation of more than half of Iran’s population. JFI calls on the Islamic Republic to lift the mandatory hijab laws and instead safeguard women’s rights to education, work, participation in cultural life, access to public services, and freedom of movement. JFI also calls on the United Nations, in particular the Special Rapporteur on Violence against Women, the United Nations Working Group on Discrimination Against Women look into gender-based discrimination in policies and practice; and the Special Rapporteur on Human Rights in Iran, to include the issue of “forced hijab” in Iran in their agenda and use all means at their disposal to force the Islamic Republic to lift the law on mandatory hijab.